Pan-Seared Flank Steak with Chimichurri Sauce – Argentinian style dinner that you can make at home! 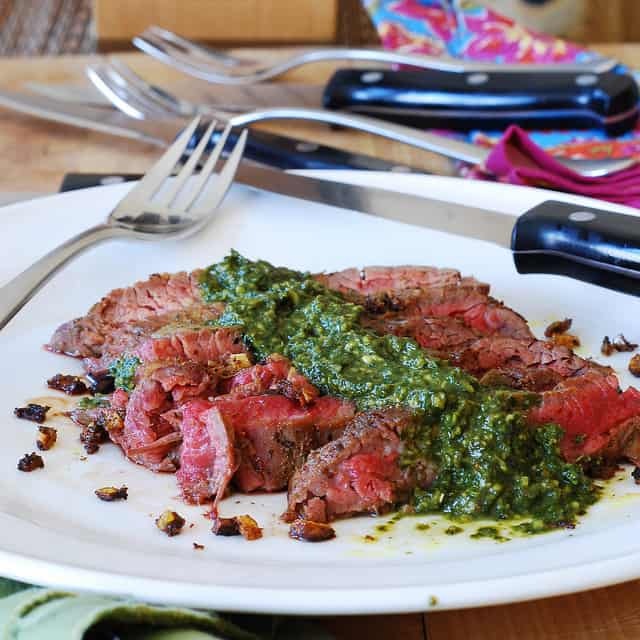 Flank steak is cooked in lots of spices, then topped with a spoonful of Chimichurri sauce. You don’t need much sauce for each serving, because it has a pretty strong flavor. I love to serve the thin strips of flank steak over mashed potatoes. Before I tried this Argentinian sauce, I’ve never taken the steak covered in a green-colored sauce seriously. Steak served in a red, wine-based sauce (or some sort of demi-glace)? Bring it on. Steak smothered in something green and garlicky? I did have some initial reservations about that. Well, what do you know, the pan-seared flank steak with Chimichurri sauce is now one of my favorite ways to eat steak. I’ve introduced this dish to several other people in my life: my husband, in-laws, friends (none of them ever had a steak with Chimichurri sauce before), and each time I encountered the same reaction: a little skepticism about green sauce turned into curiosity to try something different on steak, and next thing you know everybody is in love with this dish. Chimichurri sauce is actually a very popular traditional Argentinian sauce, widely used with grilled steak, chicken and other meats. If you’ve never tried it, you will be pleasantly surprised to discover the whole new array of flavors that you can serve with your steak. 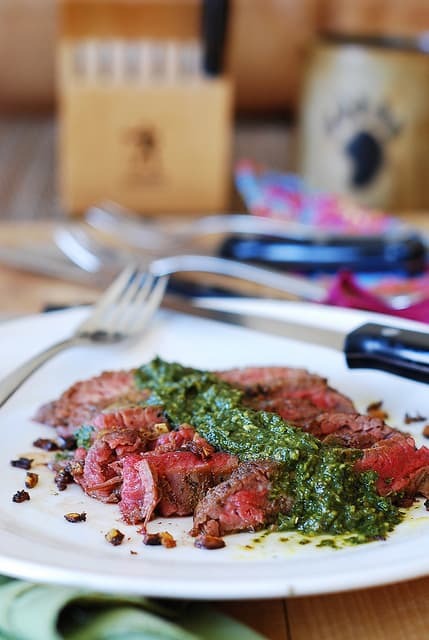 Another reason I highly recommend flank steak with this sauce is because it’s so easy to make! 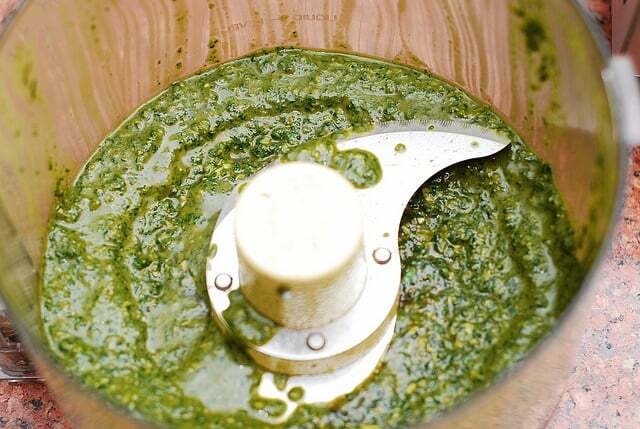 To make Chimichurri sauce, you just place all ingredients in the food processor and that’s it! To prepare the flank steak, you just use a grill or sear it on high heat on stove top in spices for a total of 10 minutes – and it’s done! This is my go-to dish during the weekdays, when I have a lot of work to do during the day and don’t have time to fuss in the kitchen in the evening. 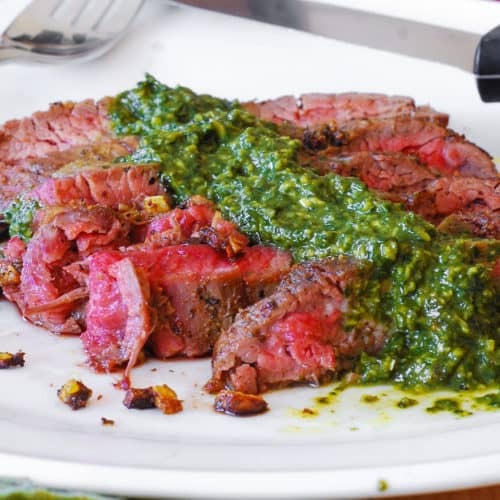 Flank steak is also one of the cheapest steak cuts, and when it’s spiced up as in this recipe and served with this green sauce – it becomes a very tasty and good-looking meal without a lot of strain on your wallet. To make Chimichurri sauce I use fresh parsley. 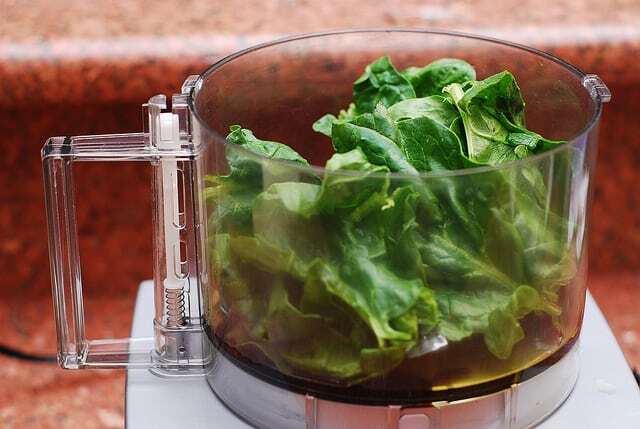 You can also use fresh spinach (washed and rinsed) in place of parsley. Pan-Seared Flank Steak with Chimichurri Sauce. Chimichurri sauce is a very popular traditional Argentinian sauce, widely used with grilled steak, chicken and other meats. 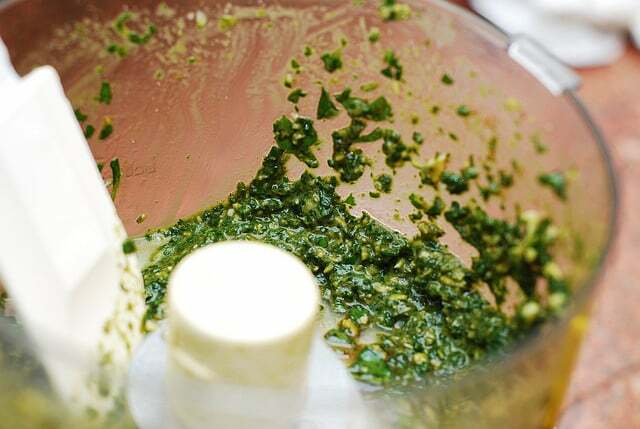 Place all ingredients for the sauce in the food processor and blend for about 4 minutes until you get pesto-like sauce. Using spatula, transfer sauce into a bowl. Mix all spices together in a small bowl. 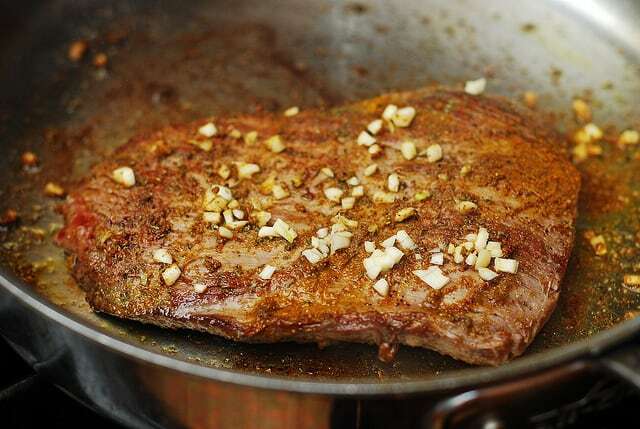 Rub spices on both sides of flank steak, scatter chopped garlic over steak. Heat a large skillet on high heat until very hot, add 2 tablespoons olive oil (it should sizzle). Add flank steak (with spices and garlic) and sear it on high heat about 4 minutes on one side. Flip it over, add 2 more tablespoons of olive oil, and sear 4 minutes on another side. Cover the skillet with the lid – let the flank steak rest, covered, for about 5 or 8 minutes. Transfer cooked flank steak onto the large platter and slice it into thin strips, against the grain. 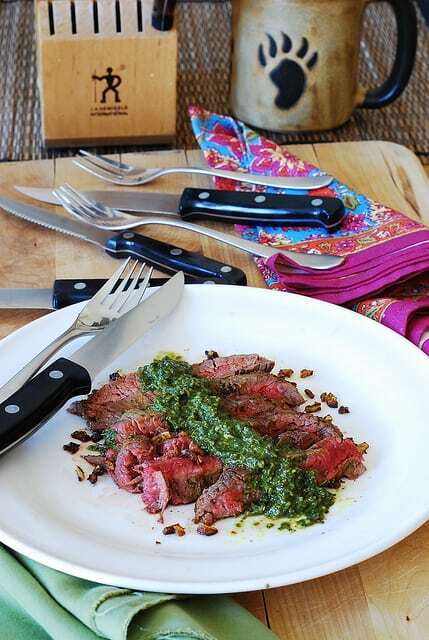 Place strips of flank steak in the middle of each plate, top with a spoonful of Chimichurri sauce. Just made this tonight and it was WONDERFUL!! I didn’t have the sage so I substituted with Bells seasoning and it came out perfect. Thanks for sharing!! my sauce is brown, the balsamic turned it all brown. What did I do wrong?